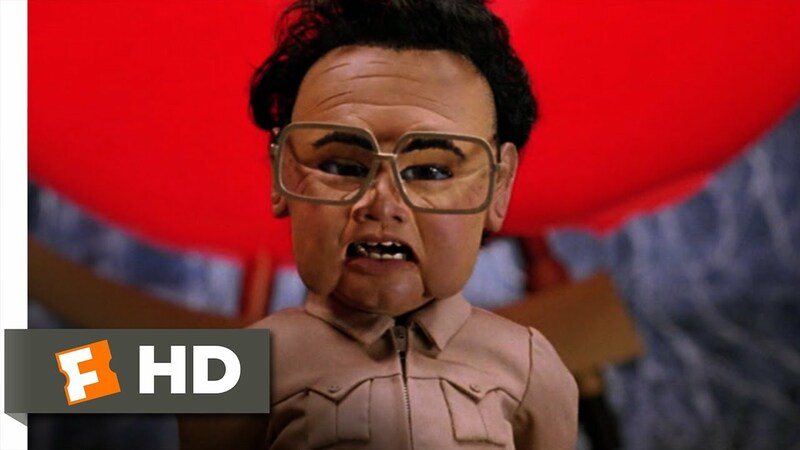 Kim Jong Il (Trey Parker) sings about how lonely it is to be an evil dictator. Directed by South Park creators Trey Parker and Matt Stone, Team America: World Police is a tongue-in-cheek but nonetheless politically biting send-up of the CGI-laden, big-budget action movies that have taken an almost exclusive hold over mainstream box offices, particularly during the summer months. Inspired by the Thunderbirds, a popular 1960s children's series, Team America: World Police uses similarly styled, but significantly more crass, marionette puppets in lieu of computer-generated images to breath life into an elite group of adventurers known as Team America. Their mission: to travel the world, root out its terrorists, and keep evil at bay. Aside from intentionally employing all of the hallmarks of standard action-adventure blockbuster formulas, from a prototypical hero to his communist arch-rival, the film also boasts the occasional musical number. The puppets were created by Norman Tempia along with Charles and Stephen Chiodo, the brothers behind the cult classic Killer Klowns from Outer Space. Team America: World Police is not based on Team America, a 1980s series from Marvel Comics, which followed a patriotic team of racecar drivers.